Earlier today I was reading a blog post on the National Restaurant Association web site, titled, "7 Steps to Successful Cardboard Recycling." In the post, they stated that "many restaurant owners want to recycle, but don't know how or where to begin." After 30 years of working with restaurant owners and managers, the one thing we know at Orwak is that if you want your restaurant to have a successful recycling program, the first step is to invest in a cardboard baler. Listed below are 6 reasons why every restaurant should have a cardboard baler. The first step in cardboard recycling is to know just how much cardboard you have. You can do a simple visual waste audit by looking at the composition of your trash on a weekly basis. If 50% or more of your trash is cardboard, you are a good candidate for a cardboard baler. Cardboard boxes take up space. Dumpsters take up space. But small footprint cardboard balers do not take up much space. If you have 6 square feet and a 110 electric outlet, a cardboard baler is the best solution for cardboard recycling. With a cardboard baler, you simply throw the box in as is, and close the door. The autostart feature will begin compacting the box immediately and quietly. On average cardboard balers save restaurants between 40-50% on trash removal costs - and many receive rebate checks for their cardboard bales. To find out just how much your restaurant can save, use our online ROI calculator to calculate your annual costs with and without a baler! A sample graph of the output is shown below. According to the National Restaurant Association, "Waste material, such as cardboard shipping boxes, often has significant market value as useful new products. Boxes can be recycled and turned into paper cups or other items if the material isn’t contaminated." Because baled cardboard is more desirable than unbaled cardboard, recyclers are willing to pay a premium for it. Orwak North America has relationships with hundreds of recyclers across the country. We can help you get connected with a recycler and estimate just how much to expect for your baled cardboard. Since the 1980's Orwak has been helping restaurants create successful cardboard recycling programs. 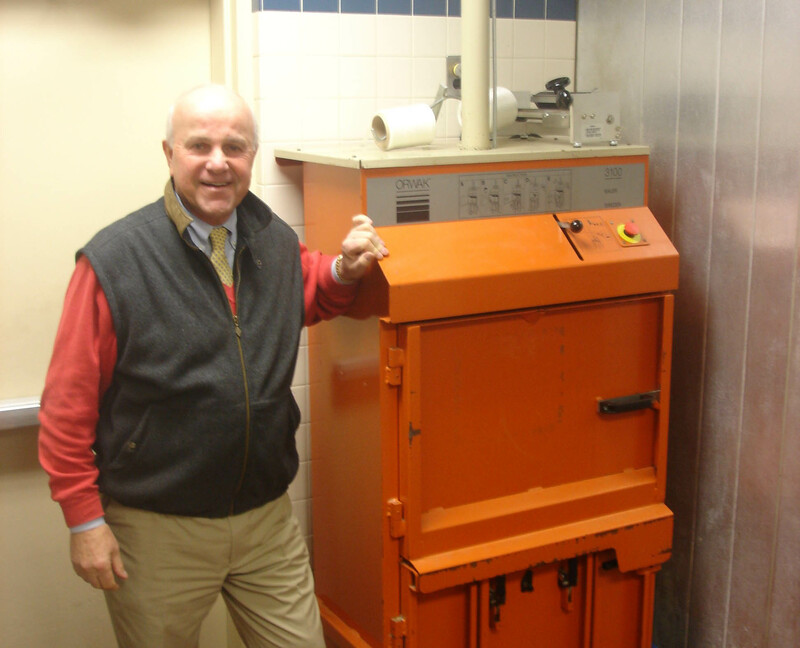 Visit our success story page and our blog to learn how restaurants like McDonald's, TGI Fridays, Burger King, Pizza Hut, Chick-Fil-A, Red Lobster, Hard Rock Cafe and many more have saved big by using Orwak compactors and balers at their restaurants. Click the image below to watch a 4 minute video clip of Peter Miller of the Flushing Queens McDonald's talk about his experience with his Orwak Compact cardboard baler. Interested, but want to see if a cardboard baler will really work for YOUR restaurant? We understand. Orwak's Try and Buy Program allows you to place an Orwak baler at your location for 21 days with no money down. Get started by reaching out to our team of experienced waste reduction experts for a quick assessment. Caution - This could lead to a decade, or more, of savings! You can also reach us by calling 866.766.7925. As Jeff Clark, program director for the National Restaurant Association's Conserve program, points out, “Focusing on recycling your cardboard will help you get big bang for your buck by reducing the size of your waste stream and the need for a big dumpster to hold your trash." Make sure to keep a log of your waste management expenses before and after you begin using a cardboard baler in order to accurately asses the impact of your recycling program. Once you have an understanding of just how much you've saved, you'll understand first hand why every restaurant should have a cardboard baler.